The framed paper honour roll commemorates those connected with the church who served in World War One. The service on Sunday evening in the Methodist Church was of special nature. At that service the Church Honour Roll was unveiled, and also special mention was made of Private Raymond Bennett who recently died of wounds received at Gallipoli. A large congregation assembled and an impressive special Order of Service was followed. 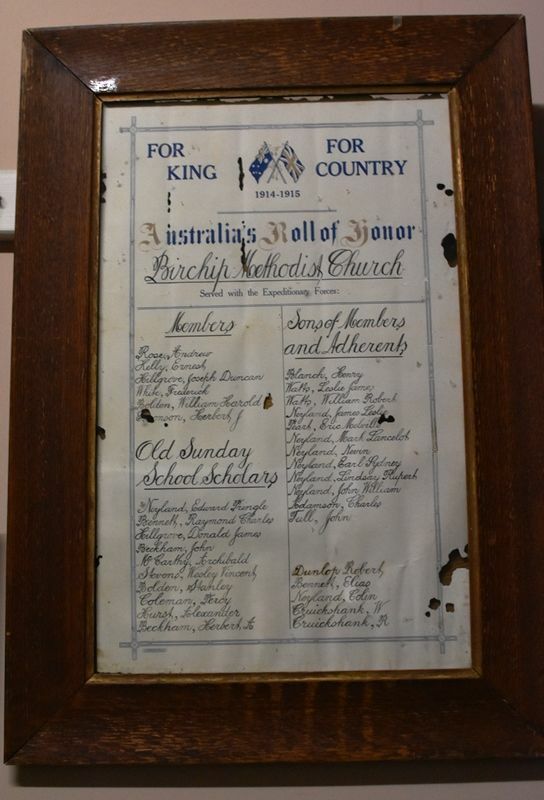 The Honor Roll containing the names of men who have enlisted and are on active service was unveiled by Mr J. Lockwood J.P.
Birchip Advertiser and Watchem Sentinel (Vic. ), 2 February 1916.